Wakey Wakey, Rise and Shakey! Who needs caffeine when you can wake up to this?! I ask you. This painting from my art journal is brought to you by M. Graham watercolor pigments (cadmium yellow, phthalo blue and quinacridone violet), Neocolor water-soluble crayons, and Polychromos colored pencils. And a good old Pitt artist pen, superfine nib. I enjoy drawing realistically, but I’m really enjoying working abstract lately, I think, because I find art to be very therapeutic. This type of artwork in particular seems to have a direct connection to my mind and emotions. It is so much more expressive for me right now, and freeing. And it feels good. Just like Friday feels good! I hope you all are dancing like you mean it today! Peace. < Rose garden, outdoor fun! Gorgeous and fun! Love the addition of the flower in the middle. I can see this in a frame, but I also wish it were on fabric…such a creative, up-lifting piece. Thank you for sharing. lol, not sure if it is too much, Lance, but I’d love your thoughts on that, if you have a moment. I’m gravitating more and more to this type of work, but not sure if it’s a little over the top? This is a keeper! Frame it! You are right, the color knocked the socks off today. Thank you, Sharon! I really appreciate that so much! You don’t think it’s too much? Also I’ve been thinking about you and your friends – how did it go at Blick? Color is never too much! the DB experience was fun. And, they gave us a bag filled with art supplies. I’ll post the picture of the supplies on Monday. I decided not to get the watercolor crayons…I bought more paper and a few more Tombows instead. I see the duck now, too! Very cool, thanks for pointing that out, Deborah! I’m really glad that you like this one. I may do another, larger version. I love the way your colors interact. That bit of dark sliding and swerving up. For some reason my eye move from bottom to top. I like this very much indeed. I’m really glad you like it! I’m also glad you explained how your eye moves through it, because I’m trying to learn more about composition so that I can direct the viewer’s eye with intent. It feels like I’m miles from that now, but nice to have a goal to reach toward! I think maybe the lighter colors at the bottom may have been what drew your eye there to start. I cannot stand how much I love this!!!😝😍😜. I have been visiting so many little art galleries this week in the French quarter and muses in NOLA, and I can totally see this on one of the walls – large – with a spotlight shining on it – and a contemplating bench in front of it. Oh Laura! You’ve knocked my socks off (and strangely the first thing I saw was bare feet). haha! Wonderful – vivid and engaging pattern! Have a great weekend. Thank you, Mary! You don’t think the color is too much? I’m really thinking of going more in this direction with my abstract work. Although I do enjoy the restful colors too. Thanks for your comment! Not at all – I like the boldness of the piece. Laura, I love how my eye moves through the painting. the dots are doing double time and the colors are great! I love that you love that, Rachel, because I am trying to incorporate somewhat of a method into my abstraction madness! Thank you, and I hope the show goes well today! And this is even better for you than caffeine! 🙂 The colors and movement make me want to dance! I’ll have to put on some 70s and 80s music for dancing…LOL! Andy Gibb? Bee Gees? Lol I love all the music from back then too. LOL! I was thinking Gloria Gaynor and Billy Idol! 😀 70s and 80s music make me so nostalgic (and kind of sad). LOL! I was thinking more Gloria Gaynor and Billy Idol. 😀 70s and 80s music make me nostalgic (and a bit sad). Beautiful! Love the colors and flow and the super cute little hidden flower and spiral. I’ve always liked pink, yellow, and orange together. Do you like that combination too? What goes best with orange, do you think? Ooh teal, that’s a really good one Jill! I like the complementary colors together but I always wanna throw in more for fun. What about magenta with orange and teal? Too much? What would you put with orange and teal, or would you say those two together are enough? You have a great color sense. I just love color!! I love the patterns and splotches here. It looks really great. Thank you! More to come, hopefully. I’m finding these really therapeutic. Lovely! 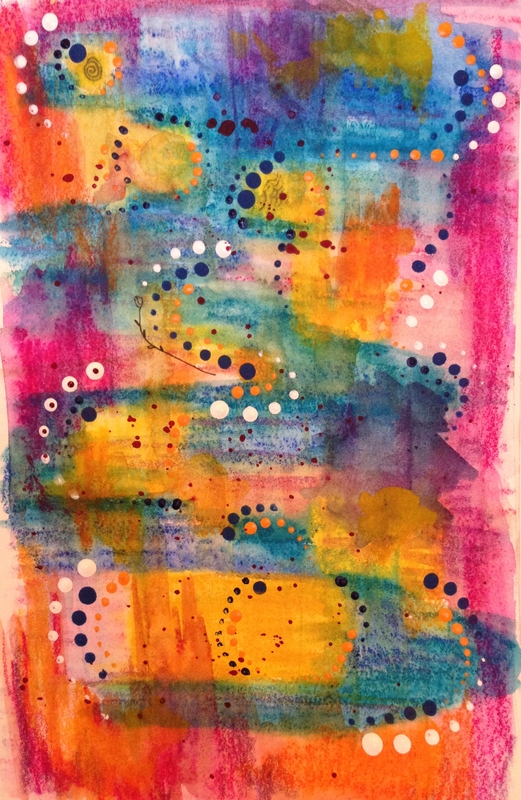 The colours are vibrant and I love the dots all over – very nice! Thanks! Dots are a little addictive to make. :)))) I had fun with this. You can do so much with them! Beautiful, bright and colorful. I found myself tilting my head, this way and that, studying it from all angles. I really like viewing this composition from the left side as though the left side of the paper was the base. I see figures facing a sunset. It seems spiritual.